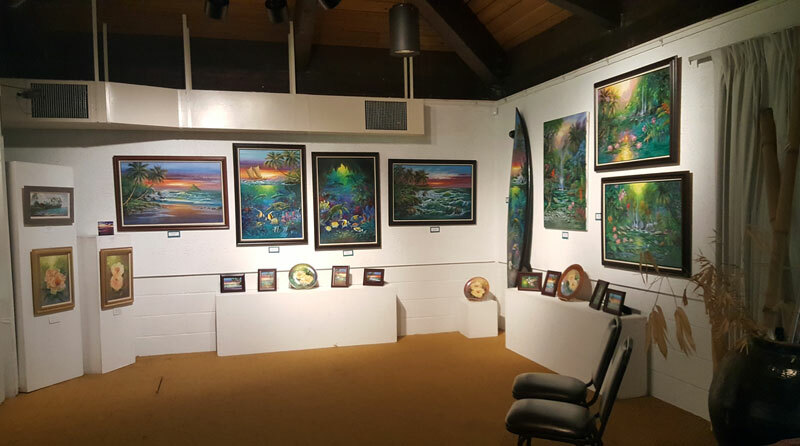 The Paradise Painters Show at Ho’omaluhia Botanical Gardens Gallery is an annual show that has been running for several years now. I have been part of it since 2014. 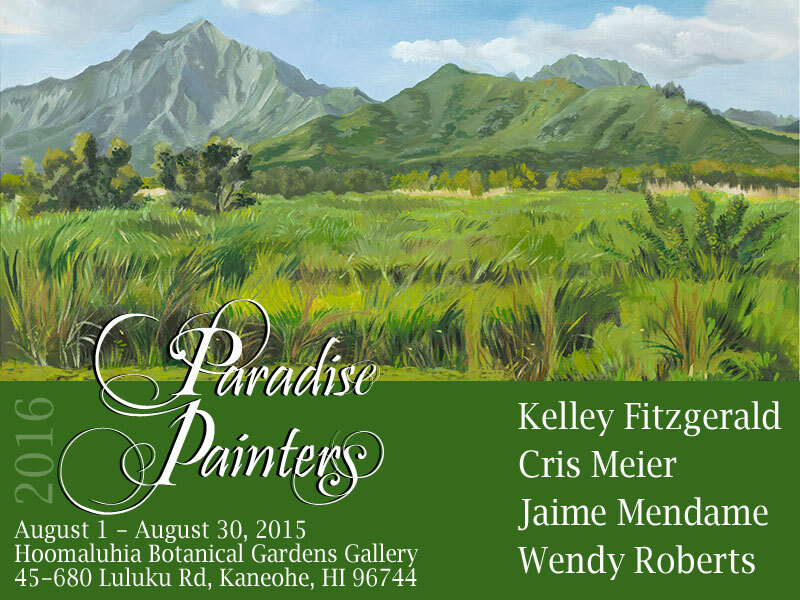 This year, the artists in the show are: Kelley Fitzgerald, Cris Meier, Jaime Mendame, and me. 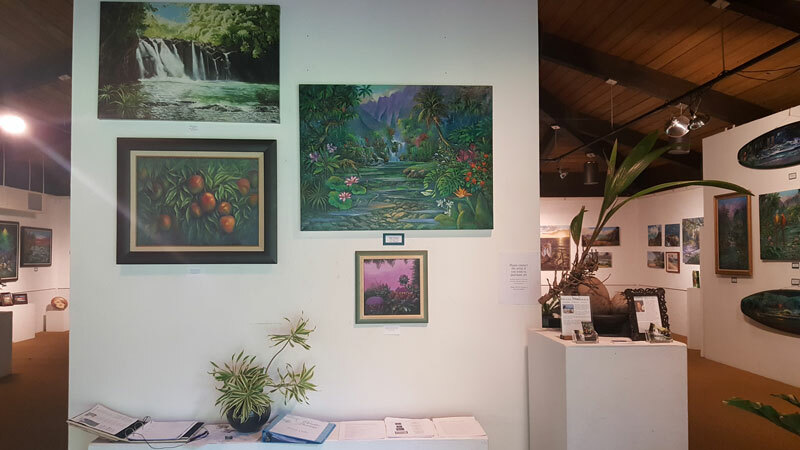 The show is up until the end of the month and also features floral arrangements from the talented Ho’omaluhia staff and floral arrangement students. As usual, I added one bouquet from my yard featuring torch ginger and orange heliconia psittacorum nestled in laua’e ferns which is pictured here with my triptych “New Day at Kawanui”. Every week the show is slightly different. 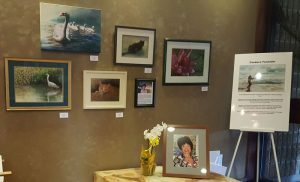 The art changes as it is sold, and the staff has made the floral aspect of the show gorgeous and interesting. They refresh the flowers every Wednesday. 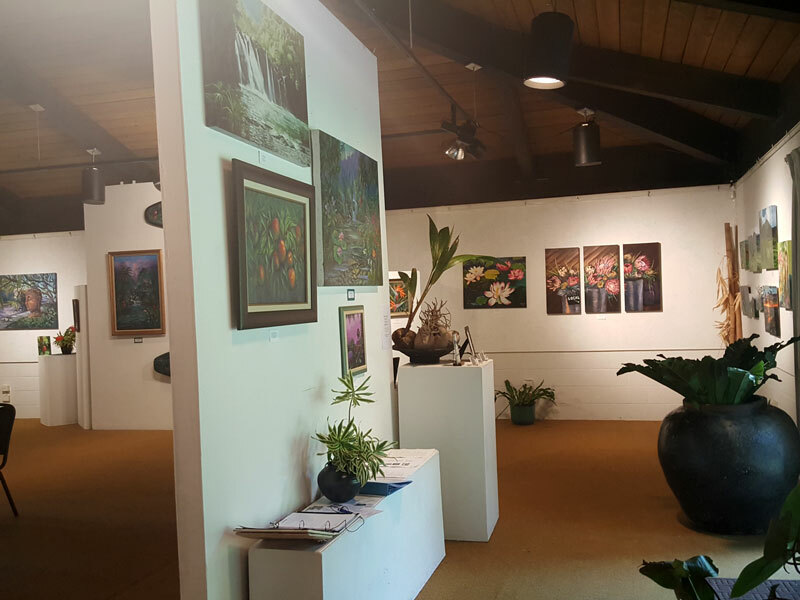 So far, between the changes in the art and the flowers, the show has been significantly rearranged three times already! Kelley Fitzgerald and Wendy Roberts work is intermingled in a largely ocean-themed corner. The talented Cris Meier with her intricate, detailed art. 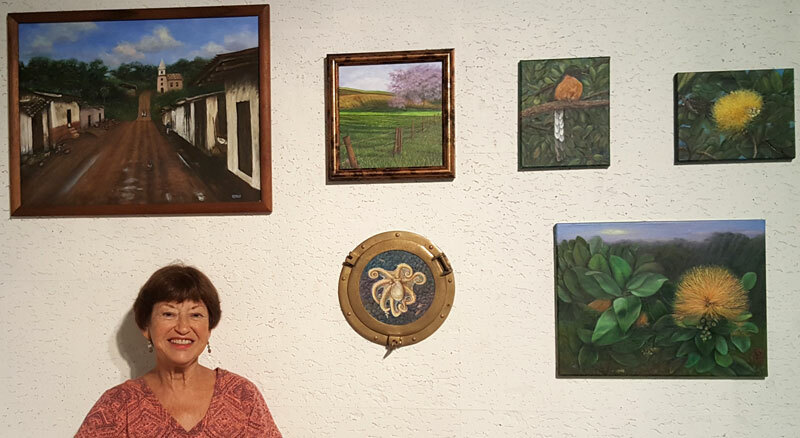 The “He’e” porthole and “Jacarandas in Upcountry Maui” (pictured in the center of this photo) sold to a buyer who could not wait the duration of the show to pick up the work, so the exhibit has been reconfigured and now you can see different works from Cris. 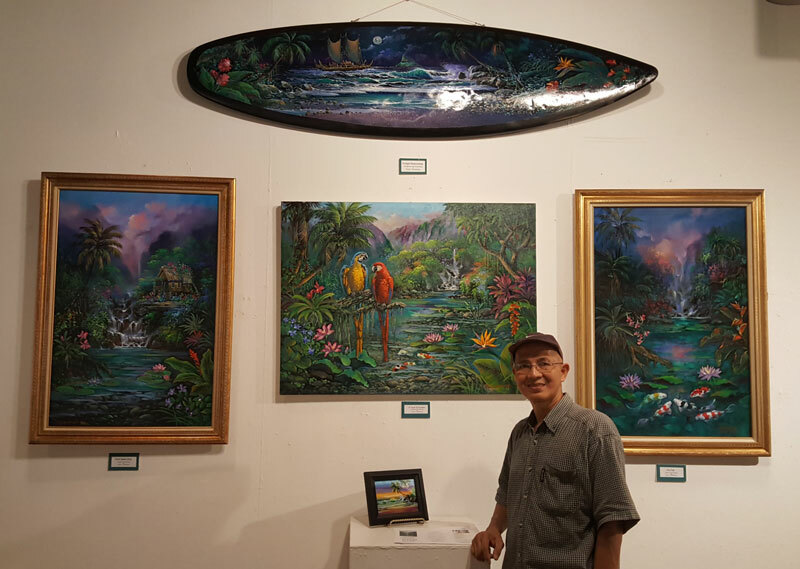 Jaime Mendame with his dreamy Hawaiian artwork. He will be on site sporadically to demonstrate his painting technique. It is fun to watch him paint! There’s nothing quite like going to see the art in person. The photos don’t capture the colors and textures fully. If you have time, you should stop by to see the show in person. While you’re at it, pack a picnic or plan a walk through the glorious gardens! This is one of the most beautiful gardens I have ever seen thanks to the towering Koolaus and exotic plants from around the world. I never tire of the scenery, even after countless visits. I plan to go paint on-site at the gallery at least once during the show, so if you are interested in knowing when I will be there, contact me and I will include you in an email alert that I will send out a day or two in advance. This summer has been happening so fast! I will play catch up and post a few photos from the Association of Hawaii Artists 90th Anniversary Show at the Honolulu Country Club. 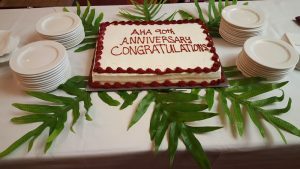 It was quite an elegant night, marking AHA’s longevity in style. AHA is suspected to be the oldest art organization west of the Mississippi, as stated in the Awards Ceremony, but I haven’t verified it personally with research. If not the oldest, it is certainly a contender. We also came together as artists to celebrate the life of Candace Fenander who recently passed from cancer. A segment of the night was spent recalling happy memories of her amazing talent and vibrant life. She was definitely a good role model for a life well-lived! The evening included wonderful friends, live harp music, and a beautiful cake. 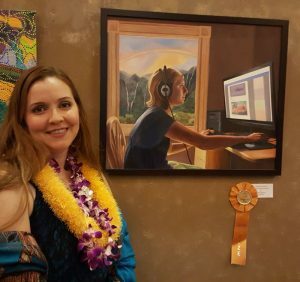 I was awarded Best in Show for my painting “/*Internet Series*/ function Distract (User)”. As part of my prize, I was given an original watercolor of a European scene painted by Candace Fenander! What an amazing and generous gift!